In Part 1 of our blog series we discussed the different types of deep foundations and some of what goes into their design. Once a deep foundation system is selected and load requirements are determined, the process of constructing them begins. In this post, we will focus on quality control and integrity testing related to deep foundations. Successful deep foundation projects include quality programs to validate the design assumptions and determine if the contractor can install the deep foundation as planned. For most projects, the quality program is structured around two distinct operating procedures: observations and testing. Observations have been a part of deep foundation quality programs for as long as deep foundations have been around. In many cases, they provide some of the most useful information to the design team in evaluating the abilities of individual deep foundation elements to meet the design requirements. Unfortunately, observations often do not explain why something occurred, but only give the result, such as a high grout-take for a portion of an auger-cast pile, or a driven pile having a sudden decrease in penetration resistance. Hopefully, the geotechnical engineer has gathered enough information from the design or even the construction phase of the project to interpret the observation results in a meaningful manner. Specific observations during construction of a deep foundation system vary depending on the system. In general, observations include the installed depth/elevation relative to design depth/elevation, resistance to driving or drilling, and the measure of how plumb the pile top is. For drilled foundations, the amount of concrete or grout placed relative to the amount of drilled material is also observed in addition to testing the grout or concrete for consistency and strength. The bottom of a drilled shaft may be observed to document that the toe will bear in sound material. Similarly, a driven pipe pile will usually be observed for indications of damage, sweeping and/or water. With recent advances in technology, most observations are supplemented by electronic recording equipment that can count the number of blows for a driven foundation, record the depth, grout volume and pressure for auger-cast piles, and many other pieces of data. However, computers cannot yet record every detail of construction. Thus, there is a need for a human observer during the installation of deep foundations. Due to the associated costs, load tests are often performed only on test piles, but may also occasionally be performed on production piles. Some load tests are destructive. A destructive load test is a test that can damage the deep foundation, or significantly alter the soils or rock supporting the deep foundation. In either case, the test pile may not be able to perform as designed after the test, and such test piles are sacrificed and not incorporated into the foundation system supporting the structure. Other tests are non-destructive. A non-destructive load test is a test that allows evaluation of the resistance and structural strength of the deep foundation, while also allowing the deep foundation to meet the project requirements for performance after the test. A deep foundation subjected to a non-destructive test can still be used to support the structure. There are different types of load tests and even different purposes for performing them. Static load tests can be performed by applying the load to the top or bottom of the deep foundation. The load type(s) and magnitude(s) applied to the test pile determine if a static load test is destructive or non-destructive. Most static load tests are done with the intent of determining the ultimate resistance of the deep foundation, so this type of test is typically considered a destructive test. Dynamic load tests are only performed by applying the load at or near the top of the deep foundation. Similar to static load tests, dynamic load tests may or may not be destructive depending on the load type(s) and magnitude(s), but the determination also depends on the type of deep foundation. However, most dynamic tests are non-destructive since only a portion of the design load is applied to the deep foundation as a force. For a static load test where the load is applied to the top, some form of reaction system (typically piles connected by beams) is required to apply the load. The main beam is centered over the test pile and a hydraulic jack and load cell are placed between the beam and the top of the pile. The pile top is instrumented to measure deflections so the ultimate load-carrying capacity of the deep foundation can be evaluated. Application of the load at the bottom of the pile most commonly uses an Osterberg Cell (O-cell) that is similar to a hydraulic jack and contains instrumentation for measuring O-cell expansion and strains. This approach does not require a reaction system as the skin friction of the deep foundation provides resistance to testing the end bearing of the deep foundation and vice versa. Like a top-load test, the top of the deep foundation is instrumented when applying the load to the bottom of the deep foundation, to evaluate the foundation’s ultimate load-carrying capacity. For either case of applying the load to the top or bottom of the deep foundation, instrumentation at different locations can be installed along the deep foundation length to allow evaluation of the skin resistance provided by different soil or rock layers. 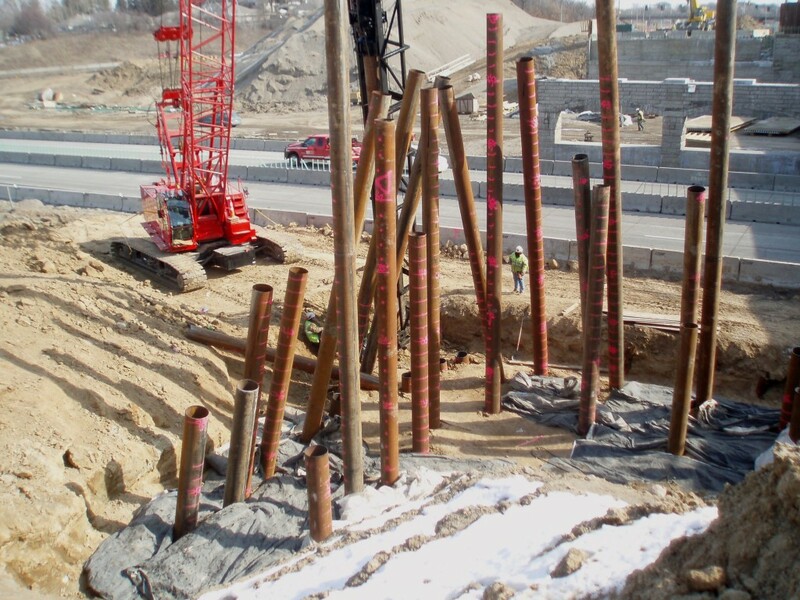 Dynamic load tests consist of an impact load usually applied by a drop weight or power-driven hammer, like a diesel hammer used to install driven piles. They can also use a mass and an explosion to create a force-pulse in what is often referred to as a quasi-static load test. Most often, dynamic tests are referred to by the test equipment – PDA (Pile Driving Analyzer) for a high-strain, fully-dynamic test, or Statnamic, for a high-strain, quasi-static load test. 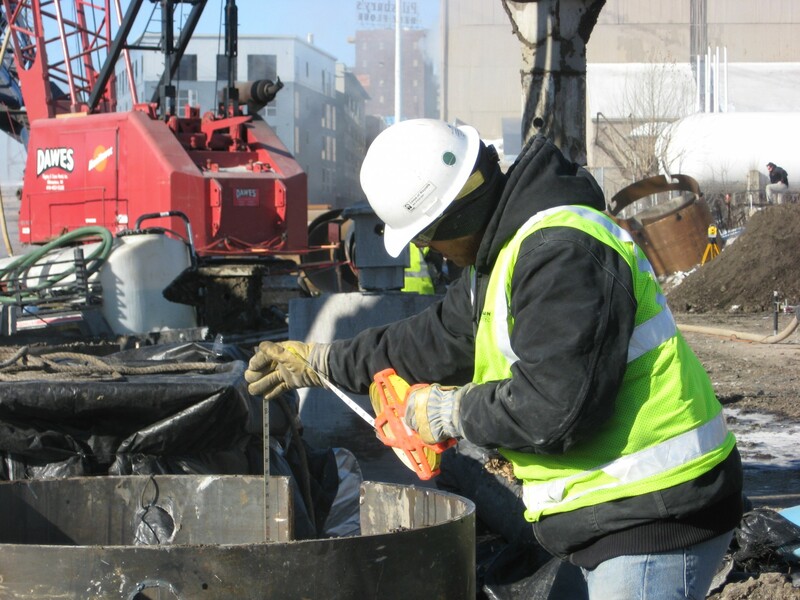 Both types of testing require numerical methods to determine the overall deep foundation resistance and the resistance provided by different pile segments and the pile toe. From a geotechnical engineering perspective, performing a load test to failure using instrumentation is most useful. This approach allows us to obtain the most information from the load test and can result in reducing the overall deep foundation length either by lowering the safety factor (or increasing the resistance factor for LRFD methodology), or by using higher shaft resistance values or end bearing resistance values. Of course, there is always the possibility that a load test will indicate that certain soil or rock layers do not provide as much resistance as estimated during design of the deep foundation system. Usually with a conservative design this does not happen, but it can occur. When resistance is under-estimated, having instrumentation along the deep foundation length allows for the use of the actual resistance values for a revised design. The downside of performing a load test is that it often requires a robust (i.e., expensive) reaction system for a load applied to the top of the foundation, and the sacrifice of equipment needed to apply a load to the bottom of the foundation (which can also be expensive). There is also difficulty defining failure and the different criteria methods to do so. We might need a Part III to discuss that topic! Integrity tests are usually performed on production piles in conjunction with observations. Thus, integrity tests are non-destructive tests intended to assist in evaluating the in-place shape of the deep foundation. Braun Intertec performs integrity tests most often on drilled, deep foundations since the act of driving a pile into the ground is a form of integrity testing itself. The most common integrity tests used with deep foundations are cross-hole sonic logging and low-strain tests using either pulse echo or transient response methods. Cross-hole sonic logging requires installing access tubes within the shafts. After the grout or concrete has reached sufficient strength, a transducer and receiver are placed inside the tubes. The time required for a sonic wave to travel from the transducer to the receiver is measured as the transducer and receiver are raised together from the bottom of the tubes. The process is repeated until all possible combinations of transducer and receiver pairings between the tubes are tested. The data is evaluated to determine if there are significant differences in arrival time of the sonic wave that indicate an abnormality within the deep foundation. Low-strain integrity tests are performed by attaching an accelerometer to the top of a deep foundation and hitting the top with a lightweight (1- to 8-pound) hammer with a special cap. The cap on the hammer lengthens the impact pulse so that it is suitable for integrity testing. The accelerometer then measures the pile response to the induced stress wave. A good test will show a clear toe reflection at the anticipated length. However, numerous factors can influence the quality of the test and the results. These factors include soil resistance, material properties (strength, density, etc. ), reinforcement within the deep foundation, and the length of the deep foundation. 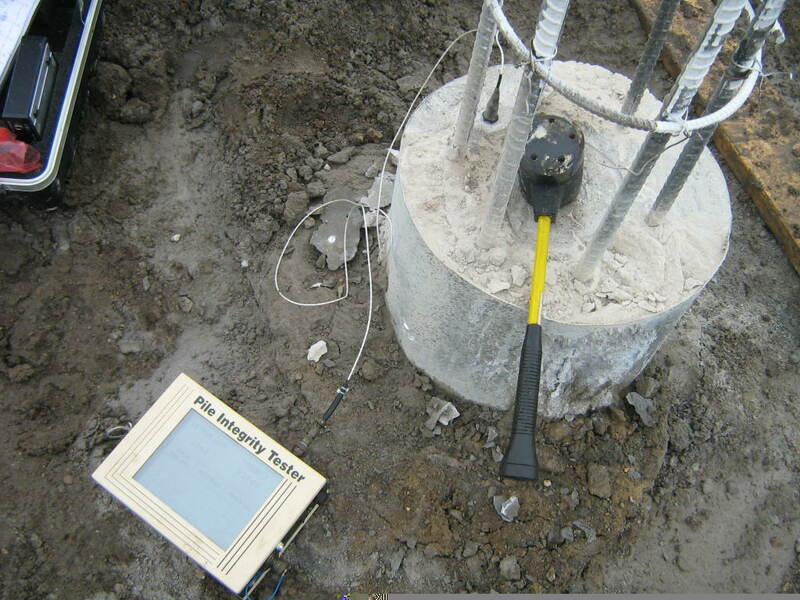 As a general rule of thumb, integrity testing is practical for deep foundations with a length that is about 30 times its diameter, (e.g., we can reliably test a 1-foot diameter deep foundation to a length of about 30 feet) although Braun Intertec team members have successfully performed tests on deep foundation lengths up to 60 times the diameter on multiple occasions. Experience, the wonderful teacher that it is, has repeatedly taught us that a successful project starts with planning and design and ends with a good, quality program. The only “real way” we can know what a contractor builds below the ground is to exhume it, which defeats the purpose of putting it there to begin with. A comprehensive program that includes detailed observations, load tests and applicable integrity tests, can provide us with enough information to apply our engineering judgment on the overall ability of the deep foundation system to meet project requirements. For more information on deep foundations, contact Matt Glisson.